Marc Marquez became the first rider in MotoGP history to come through Q1 and claim pole at the Thailand Grand Prix on Saturday. In the maiden edition of this race at the Buriram International Circuit, the defending champion suffered a crash in FP3 that scuppered his chances of going directly into Q2, instead finding himself faced with the task of finishing as one of the two fastest riders in the initial session. 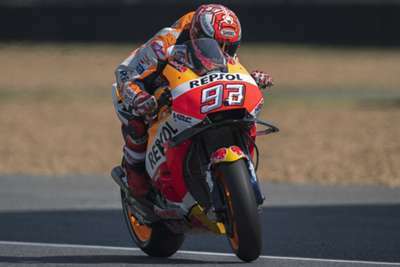 That proved no problem for the Repsol Honda man, however, and he carried that momentum into Q2 to top the timesheets in one minute and 30.088 seconds, just 0.011secs clear of Valentino Rossi (Movistar Yamaha). In doing so, Marquez brought up the 50th pole of his premier class career, while Ducati's Andrea Dovizioso (+0.139s) completed the front row as he looks to close the 72-point gap to the four-time champion in the standings. "I'm happy how I finished the day but we were unlucky [in FP3]," Marquez told a media conference. "We managed it in a good way, we were able to be competitive in FP4 with used tyres. "In Q1 I rode very good, in Q2 maybe I pushed too much, I made a few mistakes and missed some apexes of the corners. "I didn't make my perfect lap but even like this I was able to be in the pole and I'm happy because the front row was my main target."